In June 2011 there was an e-mail from Stuart Morris telling me about several abandoned villages, including one at Egerton, not far from Ludlow. I went to the site of Egerton (at OS SO605812) in September 2011, and afterwards visited a number of other abandoned villages in the same part of Shropshire. Egerton lay on a south facing hillside, with a small stream running through it from a spring at its northern end. 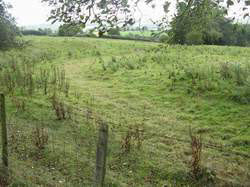 Earthworks, baffling to the untrained eye, such as mine, are visible on both sides of the stream. Egerton receives a few brief mentions in a number of medieval documents. 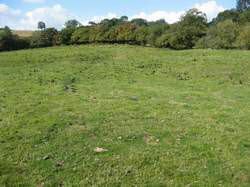 The earliest reference occurs in 1256, when local court records show that John de Bromdon sued Walter Hacket, the main landowner at Wheathill and the surrounding area, for disseizing him of a right of pasture in Egarton. In the Nomina Villarum of 1316 Egerton is listed as a vill as well as Wheathill, though both had the same landlord, another Walter Hacket. Then in the Lay Subsidy roll of 1327 one of the people listed under Wheathill was Johanna de Egerton, who presumably lived there. The last reference to Egerton as a settlement apparently occurred in 1629, though features such as Edgerton Close and Eagerton Wood appear in records over the following two centuries. I have come across two attempts to interpret the earthworks at Egerton. They disagree with each other. One of them, seen on the Discovering Shropshire's History website, appears to be a summary of information kept in the Shropshire Historic Environment Record. 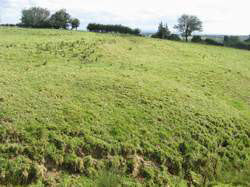 It suggests that there may have been several house platforms in the most southerly of the three fields where earthworks have been found, the area shown on the photograph on the left. 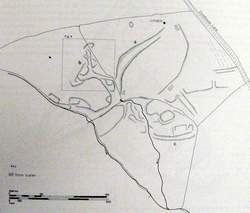 An article by Everson and Wilson-North contains a plan of the whole site and a more detailed plan of an area at the north west of the settlement. They argue that this area, marked b on the larger plan, contained a farmhouse and yard. The house, 5 by 15 metres, would have been built of stone or at least had stone footings. The building had three rooms, and an opening on the southern side may have been the doorway. 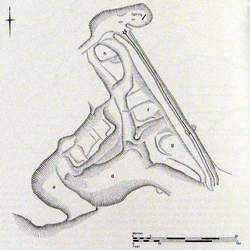 Everson P and Wilson-North R, Fieldwork and Finds at Egerton, Wheathill, Shropshire History and Archaeology 1993 68 65-71. In the area to the south east of the farmhouse where the HER information argued there were several house platforms Everson and Wilson-North identified the remains of a large building or range of buildings, about 9 metres by 30. From the large size of the building they assume that it was a barn or other farm buildings, though they do not rule out the possibility that it was another house. Assessing the settlement as a whole they argue that it comprised just one or perhaps two farms, not a larger community. The article by Everson and Wilson-North has an appendix describing fragments of pottery found in the eastern field after it was ploughed in 1979. The medieval pottery included sherds of cooking pots and part of a jug handle. Quite a lot of post-medieval sherds were also found. As the fragments were generally small and abraded it was assumed they did not mark the site of a house, but had been among the rubbish deposited as manure on the fields. These two plans come from the article by Everson and Wilson-North.